Pollen is the male gametophyte of plants, and its major function is to deliver sperm cells to the ovules to ensure a successful fertilisation. Sperm cells are carried inside the pollen tube, a growth extension of the vegetative cell of pollen that grows through the stigma and style tissue. The elongation/growth of pollen tubes is a highly regulated biological process, and the uptake of water is thought to account for the enormous increase in cell volume. 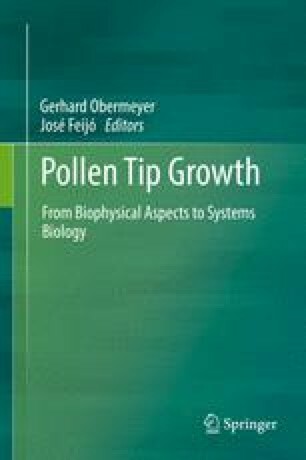 Water transport into the pollen grain initiates the transition from the quiescent mature to the active, rehydrated pollen grain and subsequently allows the large increase in volume during tube growth. To maintain the water uptake, internal pollen water potential has to be lower than the external water potential which can be achieved by lowering the turgor pressure, by increasing the internal osmotic pressure or by decreasing the external osmotic pressure. Uptake or synthesis of osmotic active compounds may be necessary to adapt the internal osmotic pressure due to changes in osmotic conditions during the tube's journey through the stigma tissue. Especially in periods of severe drought stress, the water potential of the stigma cells may drop, and thus water uptake into the pollen tube is distorted. The ability to sense and to adapt to osmotic conditions is therefore an important feature of the pollen to warrant a successful fertilisation and in consequence to ensure high crop yields.